As he does every morning, Carlos Valverde, a resident of Turrialba, turned on his computer and entered the website of the Observatorio Vulcanologico y Sismologico (OVSICORI – Volcanic and Seismic Observatory) to see what was new with the volcano in his area. 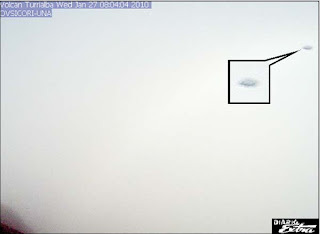 But on January 27 (2010), the image displayed on the webcam did not display the colossus – enshrouded in fog – but rather, a strange object passed in front of the camera and Valverde saved the image immediately. OVSICORI installed the camera in early January and the image refreshes ever 10 seconds, displaying the active Turrialba Volcano. Just as the image refreshed on the screen, the strange object appeared. Valverde believes it to be a flying saucer. The object appeared in a single image. Following updates did not show the strange oval mark. “The computer is in my room, and I always get up and load the page to see the volcano. That day the object drew my attention and I pressed the Copy Image function. Much has been said about seeing UFOs in the volcano, and upon watching the photo one thinks that it is like a flying saucer, a half-moon shape,” says Valverde. OVSICORI installed the camera to monitor the Turrialba Volcano’s behavior following an increase in activity and ash eruption. The recorded image was sent to UFO photo analyst Edgar Picado Chacón, who claims that at first sight, the object must measure between 25 and 30 meters. “Given the object’s distance from the camera, some 600 meters from the crater, one could venture that it is a very large object. I will be performing some analyses and dismissing some theories. However, I do not see any evidence of photo manipulation. The pixels are contiguous; it cannot be a bird or a rock hurled from the volcano, because no trajectory is visible. Any object that passes in front of the camera leaves a trace, and none can be found in this case.”The expert says that one can speak in terms of a UFO, as it is a fact that the object was flying at the location. “I cannot tell you that its a vessel from somewhere, as that would be highly irresponsible on my part. But it is something very interesting that does not look like a bird in any respect. I have a video of an object leaving the Arenal Volcano and seeing this photo reminds me of its very similar shape,” he indicated. Picado adds that the image drew his attention and unlike other photos he has analyzed, it cannot be a flash of light, as the conditions displayed on that day show cloudy conditions. The expert says that he has received several reports of UFOs in the country’s various volcanoes. Mexico: Airliners and "Unidentified Traffic"
Mexico: What Crashed in Hidalgo?